Happy April Fool’s Day! I’m traveling today so (un)fortunately probably missing some good pranks. If you’re interested in some creative ones over the years, check these out. My favorite is #5. It’s hard to believe but we are beginning to think about our next strategic plan which will guide the college from 2021-2025, since our current strategic plan goes through 2020. The current plan has proven to be a solid framework for advancing the college’s mission and vision, and we have seen tangible results in targeted expansion of athletics and academics, year-round use of the campus, creative recruiting tactics, and the cultivation of hybrid college-to-career programs. In light of the changing landscape in higher ed and in anticipation of putting together our next plan, we are convening a small group of Trustees to think about big-picture strategy. Their work will include exploring forming additional partnerships with organizations that share our commitment to our mission. I will keep you apprised periodically as to their progress and to other strategic planning initiatives as they get off the ground. We’ll be looking for your input! Paul Smith’s College was pleased to receive 2018 Tree Campus USA® recognition by the Arbor Day Foundation, reflecting the college’s commitment to effective urban forest management. 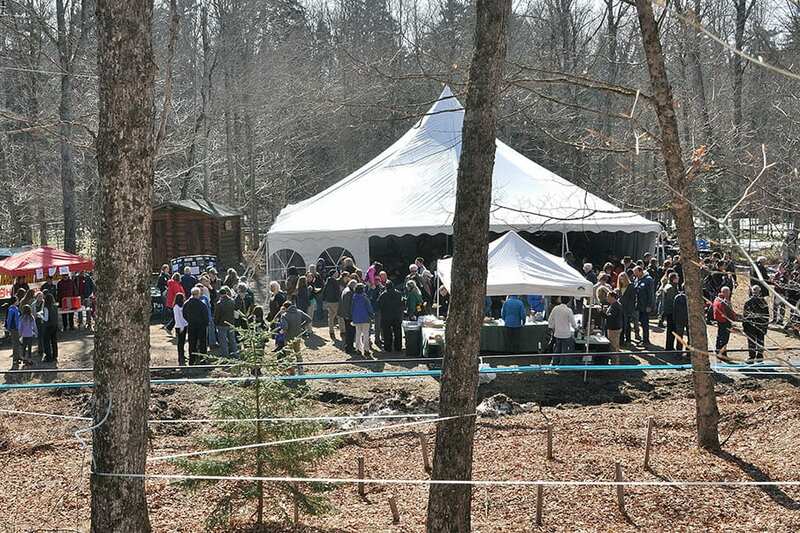 Dave Eaton ’61 and his wife Linda hosted 100+ alumni, family, former Trustees and a Trustee Emeritus, friends, and prospective students and their families at the annual spring Pancake Breakfast at Bob’s Trees in Galway. Alumni volunteers and the Eaton family served up many pancakes and gallons of PSC maple syrup. The Admissions team has visited 228 separate locations across the Northeast and South this spring. This include drop-offs, visits, and fairs. Regional fairs were attended in NC, SC, FL, PA, NJ, Rochester, Buffalo, Syracuse. And our recruiting isn’t limited to the U.S; Jodi Johnson-Rossi has been to Asia and Scandinavia telling the PSC story. Summer academic programs are being marketed across social media, emails, PR, texts, and personal connections. Students who register before Friday 4/15 with the discount code summer19 will receive 10% off. The Spring Career Fair welcomed 100+ companies, organization & Graduates schools with over 200 students in attendance. The Nordic Ski Team Traveled to Jackson Hole WY for the USCSA National Championships with our skiers notching several top 25 finishes throughout the competition. The Intramural department sponsored a Dodgeball league, involving 6 teams. The recreation department hosted the After Dark Water Aerobics Event. The 8 weeks Learn to Swim Program taught by PSC Students was completed on Wednesday 3/27. Over 35 community members attended. Men’s Basketball hosted a Youth Basketball tournament with Saranac Lake Middle and High School. 8 modified teams and 8 JV basketball teams from local schools in the North Country attended. Saranac Lake Middle won the modified division and Saranac HS JV won the JV division. Head men’s basketball coach Dominique Boone has been volunteering at Saranac Lake Elementary to host an after school 3 on 3 basketball program for 4-5 graders. Casey Gerrish, Jim Tucker, and John Morgan hosted 4 recruits and their families for the 2019 ECAC Men’s Hockey Championships in Lake Placid NY. Resident Assistant Justin treated the residents of Saratoga to a “Sweet Sweet Diversity” program where guests were able to enjoy treats from other countries and cultures, and the significance of each dish. These handmade treats were a hit! The Baking Department very generously assisted with supplies for this program. Resident Assistants Connor Gale, Bre-Ann Flouton Johnson, Katherine Gale, and Logan Hazard were recognized for their hard work and dedication to the PSC Hockey team at the Alumni game on February 23rd at the Tupper Lake Civic Center. Paul Smith’s College Hockey Team and Figure Skating Club joined forces on February 11th in volunteering to help run the 2019 Winter Carnival Ice Show at the Saranac Lake Civic Center. Ricky Williams and Amanda Jones attended the national NASPA conference. Amanda presented an overview of PSC’s chapter of the National Society of Leadership and Success. Campus Safety officers participated in several training sessions: Asbestos Awareness Training; First Responders Beware; Electrical and Natural Gas Safety. Health Services participated in the annual VAWA Conduct Board training facilitated by Deirdre Loftus and James Goodman. Health Services gave out 190 Cold Kits during the months of February and March to Students. Sodexo hosted two themed dinners — Thai and Irish food. Greta Hovland attended a one-day seminar, Spirit of Inclusion, about diversity and inclusion in the workplace. The counseling center is providing semi-monthly outreach in the first year residence halls, Currier and LMS. The Forestry Department just received a $165,000 New York State Workforce Development Institute grant for the Paul Smith’s College School of Logging and an additional $24,000 grant through the Northern Forest Center to offer additional logger education workshops and offer scholarships for students attending the summer School of Logging. Paul Smith’s College owes a huge “thank you” to Lewis Tree Service who donated a John Deere 548G-3 skidder to the College. This essential piece of forestry equipment will be used in forestry classes and by the student-run Forestry Micro-Enterprise crew. The Paul Smith’s Woodsmen’s Team took 1st place overall at the Morrisville State College Woodsmen’s Weekend this month. The team is busy preparing for Spring Meet (the Super Bowl of collegiate lumberjack sports), which will be held April 26 & 27 at SUNY Cobleskill. The IT department is piloting a Digital Literacy Trainer position to help support students, faculty and staff with their use of technology. The library is exploring the potential of zero or low-cost alternatives to textbooks in an effort to improve student success and reduce the financial constraints on students. Corey Laxson and Brenda Wiltse submitted a paper to Lakes and Reservoir Management that examines effects of road salt on Mirror Lake. Corey Laxson presented work on watershed salt budgets at the Northeastern Association of Environmental Biologists conference in Saratoga Springs. Michale Glennon submitted a proposal to NYS DEC to develop models for to inform aquatic invasive species prevention strategies. Dan Kelting submitted a proposal to NYS DEC to examine the efficacy of boat stewards and the NYS AIS transport law. Zoë Smith and Dan Kelting met with state legislators in Albany and several private foundations in NYC to build awareness of PSCAWI. Kelly Cerialo is chairing a presentation at the United Nations Educational, Scientific, Cultural Organization (UNESCO) European Man and Biosphere Conference in Ireland on April 4th called “The Role of Ecotourism in Biospheres: Bio-cultural Heritage Tourism as a New Model of Ecotourism”. In addition, as part of PSC’s Alliance for International Rural Resiliency Solutions (AIRRS) Kelly is generating an inventory of PSC’s work on social, economic, and ecological resiliency, This inventory will be used to identify opportunities to promote our existing rural resiliency efforts and to develop new initiatives and partnerships that address challenges in rural communities. Stop by the main entrance to Freer to check out the new International Year of the Salmon Exhibit. The Lake Champlain Basin Program was kind enough to send us the traveling exhibit now through April 10th. April 9 – Residence Life Housing Selection will take place for returning students.